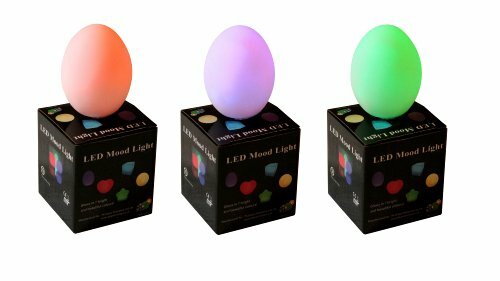 Gradual colour changing LED egg mood light for home, parties, events and wedding. The relaxing colour change effect with make the egg lamps essentials for all homes, bars, resturants and sensory rooms. In a set of 3, the LED mood lamps will look great as table centre lights for weddings and dinner events. Their hypnotic cross-fade colour change will bring a stiking mood light decoration. The freeze lock switch function allows the colour changing to be stopped on any colour for a specific static colour. Use this freeze lock for matching colour schemes at weddings and for bedrooms. The sensory lights include easily replaceable batteries that provide over 4-6 hours of continuous shine time. Being fully portable, they can be used again and again for many occasions. - Battery Requirements: 3 x AG13 batteries in each light (included and already installed). 3 extra spare batteries also included.